The 95th Transportation Research Board (TRB) annual meeting is coming to town! This annual meeting will host 12,000 transportation professionals from around the world and more than 5,000 presentations covering all transportation modes, including public transportation. At the 2016 annual meeting, Metro staff will be sharing Metro’s experience and best practices on a number of transit development and planning initiatives. 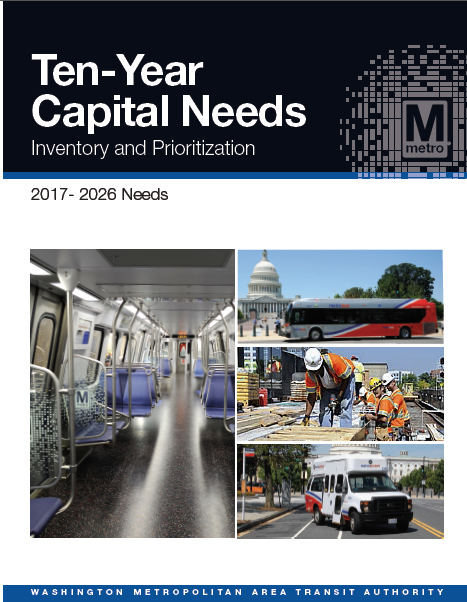 Local leaders are set to commit to Metro’s long term state of good repair needs for the first time through the region’s transportation plan, but the plan omits key investments that are critical to solving some of the region’s most critical needs. This fall the region’s transportation leaders will approve an update the Constrained Long Range Plan (CLRP) financial plan, required by federal law every four years, to ensure the region’s ability to pay for transportation expenditures with reasonably anticipated revenues. 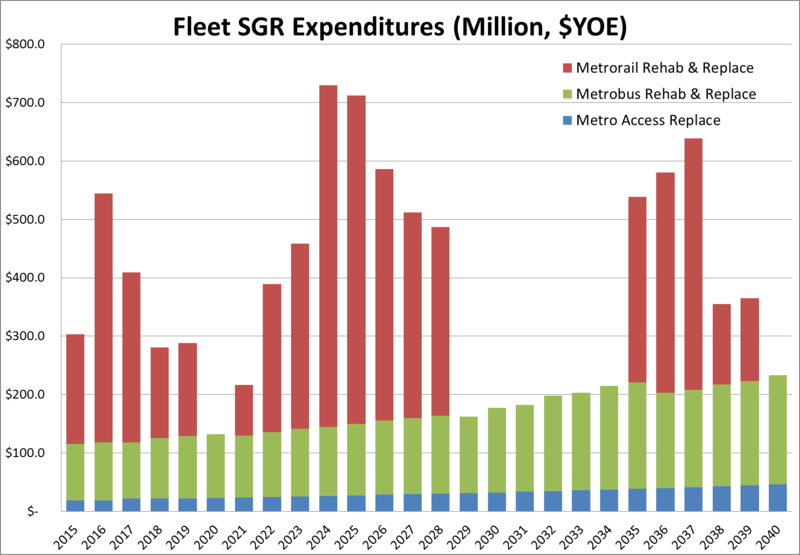 During the 2014 update, Metro collaborated with staff from the Transportation Planning Board (TPB), the region’s Metropolitan Planning Organization, and the three state DOTs to identify funding for the system’s long-term operations and maintenance (O&M) and capital needs. The draft plan, which expresses the region’s major transportation priorities, is scheduled to be adopted by the TPB on October 15th. 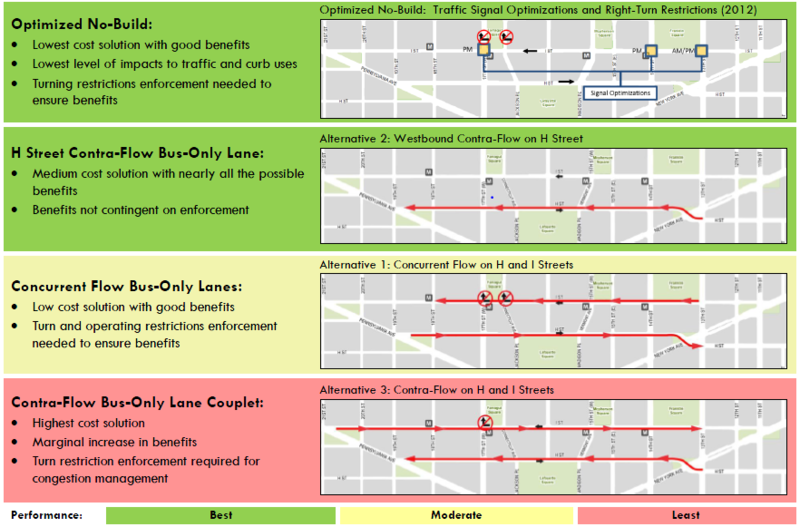 Metro has released the final technical report of the H and I Streets Bus Improvements Study, making a compelling case for traffic management improvements and bus lane alternatives in the region’s most heavily traveled bus corridor. Congestion on I Street caused by bottleneck at 17th Street, creating long queues backing up to 15th Street. DC’s downtown core is a vibrant community, with 380,000 jobs today and significant residential and retail development in the coming decade. 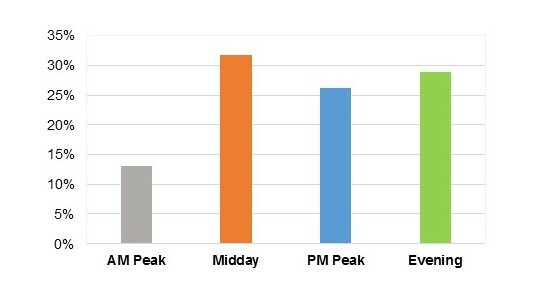 While growth will transform the core and create opportunities, it is likely to increase the burden on the transportation network that is already strained by the closure of Pennsylvania Ave.
Today, all users—drivers, bus passengers, pedestrians and bicyclists—experience congestion during peak periods. Besides high-volume traffic in the corridor, the constant friction among buses, vehicles and delivery trucks further aggravates travel experience. For bus passengers, the current corridor congestion severely affects travel time and service reliability—a short bus ride on I Street from 13th St to 19th St could take more than 10-15 minutes during rush hours. 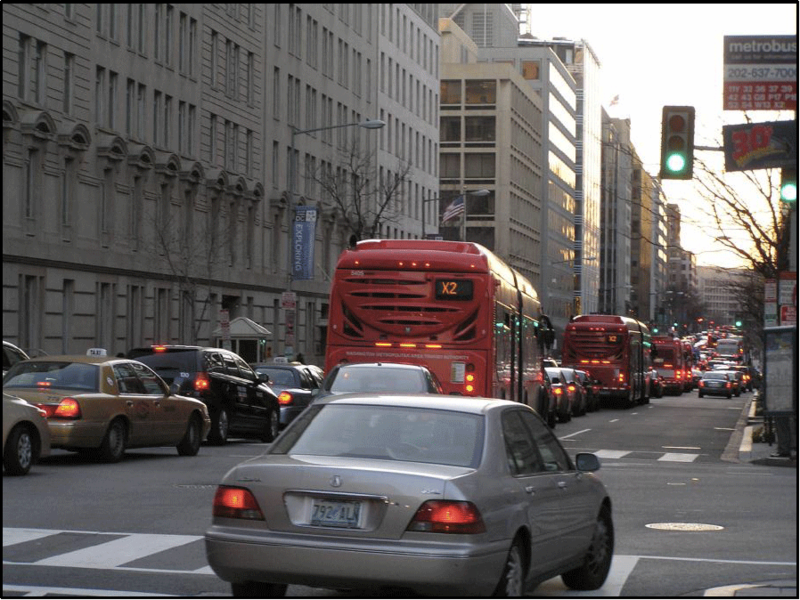 Metro and DDOT collectively launched the H and I Streets Bus Improvements Study last year to explore bus improvements on H and I Streets NW in the downtown core, the region’s most heavily traveled and most productive bus corridor. 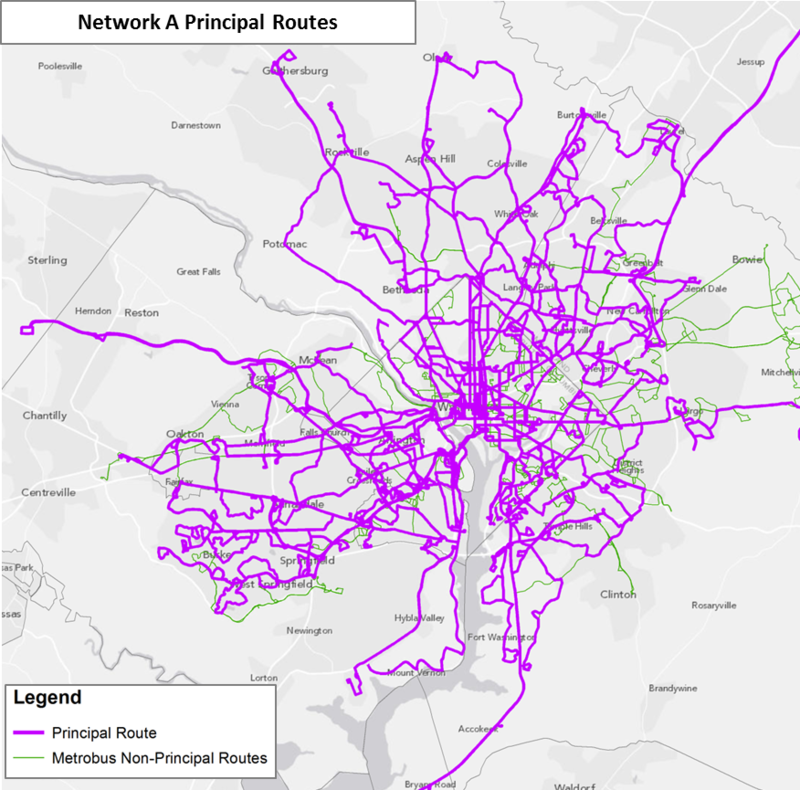 The study investigated traffic management improvements and bus-only lane options with the objective of providing reliable and efficient bus service and alleviating Metrorail core congestion through innovative surface transit improvements. The technical report is available for download (PDF) and posted on Metro’s Planning and Development webpage. Improving and expanding capacity at high ridership stations will ensure safe and efficient operations and facilitate passenger movements from street-level to platform as well as transfers between lines. The proposed stations, most of which are in the system’s core, already experience crowding or would reach capacity by 2025. 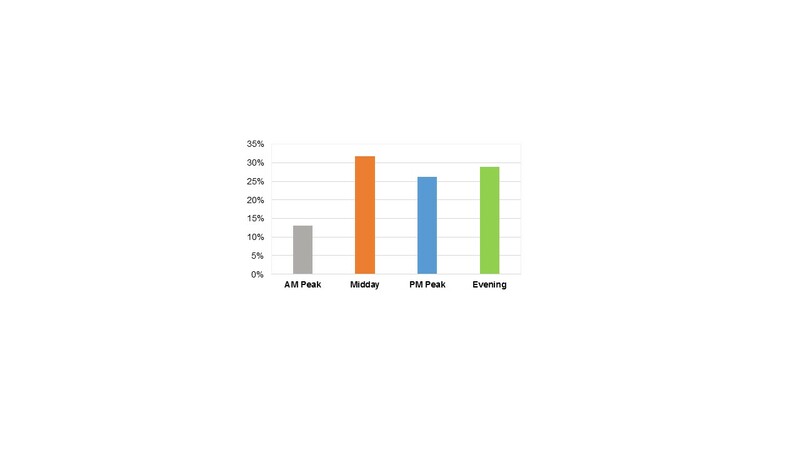 Proposed improvements vary from adding escalators and stairs to building pedestrian passageways connecting platforms within a station and between stations. 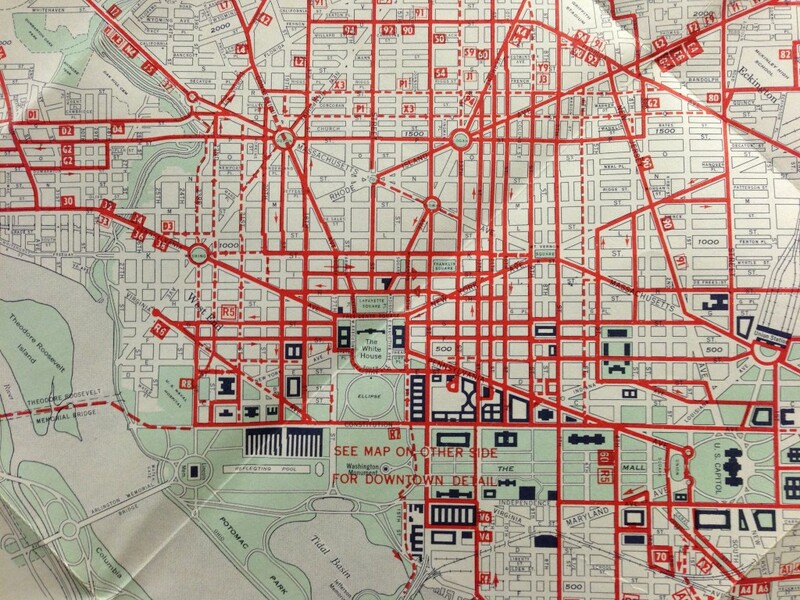 Photo of a 1969 1968 map of DC Transit System Inc routes. Many routes listed here are still running today. WMATA bus began operations in 1973, when it consolidated the four Washington-region bus operators under one system and brand. As many commented in MindMixer, many of these lines were originally streetcar lines established in the late 19th century and majority of services were based in the inner areas. The inclusion of old streetcar lines in the current Metrobus network informs a rich history about natural progression of transit network and the interaction between urban development and transit investment. The century-old streetcar investment helped develop those areas and transform them into transit-friendly markets. In return, these areas and corridors are among the most transit supportive markets today, generating high bus ridership. 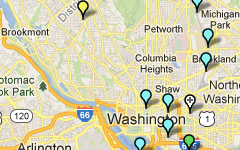 Over the past 30 years, strong growth in jobs, population and urban development in the DC region continued to demand the expansion of bus transit service from the central core to suburbs, from traditional activity centers and corridors to the new or emerging local centers and corridors, some of which are near or beyond the edge of Metrobus market. Metro currently operates nearly 300 revenue bus routes organized into approximately 150 lines throughout the jurisdictions in the Metro compact area. To better understand how the current Metrobus system serves travel needs in the DC region, Metro’s planners are conducting the Metrobus Market Effectiveness Study to identify market constraints and opportunities for Metrobus, and most importantly, strategically position Metrobus toward building an effective network that can better serve current and future demand, enhance productivity and efficiency, and improve integration between Metrobus and local services.